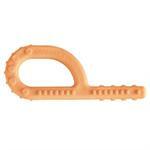 Baby Grabber® was designed to calm and soothe infants who are in the developmental stages of mouthing. Oral exploration exercises the lips, tongue, and jaw, which is essential for the development of speech sounds. ARK's Textured Grabber® is designed with three different surfaces. Each surface serves to add extra tactile sensations to the lips, cheeks, gums, and tongue. Use it to assist in transitioning individuals with sensory issues from puréed to textured foods. GRABAromas®! Now our popular Grabber XT®'s are available in four different scents! Please note that the Lemon scent is a very light scent and not as strong as the other scents. The material and colors are FDA compliant and contain no latex or phthalates. This is for oral motor treatment. Provides sensory input to gums, palate and tongue. Use by stroking, rubbing or applying pressure to all areas of the mouth with either of the two. This is similar to our Probe (#3002) but about half the size (tip). The "Mini" tip is smaller version of the Probe tip for use in little mouths. The Z-Vibe "Preefer" tip is round where a rolling action is desired. 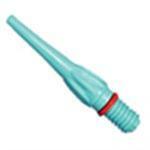 The Z-Vibe "Probe" tip comes in different textured surfaces. Use with the Z-Vibe handle. Z-Vibe Travel Kit complete comes as shown. It's a neat way to organize/carry your Z-Vibe and extra tips. Each tip can be easily and quickly identified. The see¬thru plastic vials can be labeled for each child and helps ensure sanitary conditions.